Good story!My daughter is going to read this next! Wonderful story and educational as well. Thanks for sharing your imagination and knowledge. My thoughts: Michelle Isenhoff brings us book 2 in the Divided Decade Trilogy. Book 1 was The Candle Star. Click here to read my review. In "Broken Ladders" Ms. Isenhoff introduces us to the Wallace family in Wayland, Michigan - not quite the wilderness it once was but still a fast-filling frontier. The Civil War has not actually come to their back yard, but it is impacting their family, their farm, and their town drastically. Hannah Wallace, the 12-year-old daughter of the house, moans the fact that her Pa and older brother have left to fight. This leaves Hannah's mother, her older brother Joel, and her younger brother Justin, and herself to fight the daily battles of running the farm alone.There is a loan that Pa has taken out on the farm in order to have seed and other items needed. It must be paid. But Hannah doesn't want to stay and farm. She wants to be a boy and be able to fight. But there aren't many dangers around which leaves Hannah's fertile imagination to run rampant along with that of Justin and her friend, Wes. Every free opportunity they, as children are wont to do, run off and fight their pretend war against the South.The battle is not always on the battleground or field. It is very often fought in the homes and on the farms. That is the case here. No shots are fired. No lives lost. But they are fighting a mighty battle. To save the farm. The determination of Hannah, Joel, and Justin to do just this is inspiring and telling of the character of the pioneers of this great country that is the United States of America.One of my daughters is a special education teacher and has taught middle and high school students. Here are some comments regarding this author's writing and this book which she shared with me:1. The author has beautiful use of figurative language.2. Children can relate to the dialogue of these lively characters.3. Parents will love the liberal sprinkling of historical facts throughout the books.Another book by Michelle Isenhoff that I have reviewed is The Color of Freedom. This review of an exceptional book is posted on goodreads.com!The author's books are written for the 9 to 15 year old market and she promises adventure. She also promises to protect the innocence of children in her writing. DISCLOSURE: The author provided a complimentary copy of Broken Ladders as a donation to our school in exchange for my honest review. I received this book free from the author for an honest review. It was an enjoyable read. The story revolved around a young girl named Hannah during the Civil War days and how she and her Mother and other siblings struggled every day to keep the farm while her Father and oldest brother left home to fight in the war. Tragedy and sickness drew the family closer. In the end some happiness returns to make them stronger. I can't recall if this was a Nook Friday freebie or a Book Bub advertised special, but for a free book I really, really enjoyed it. What an excellent look at how a young girl's life was altered by the realities of the Civil War. Living in Pennsylvania my whole life, Michigan is among the last places I would think of as a touching and enlightening setting for a Civil War based historical novel. And yet, it's distance from the action is exactly why it works so well. We'd like to think that young Hannah would be protected from the harsh realities of war. And yet, just like everywhere else in the country, brothers, fathers, and husbands were sent to war and losing life or limb while the families back home struggled to keep things together. Hannah's experiences and feelings felt so real. Even thought this book is intended for ages 10-14, there were moments these old eyes welled with tears.This book would make excellent classroom reading, which is precisely the author's intended use. I think a precocious 8 y.o. could enjoy this book and certainly any middle schooler. 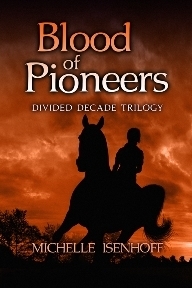 But someone of any age looking for a different approach to the Civil War will appreciate this story.I look forward to exploring the other titles in this trilogy. Another excellent book from Ms IsenhoffThis is another fast paced, historical YA read and it is excellent. A fascinating look at the everyday life and struggles of a family caught in the American Civil War. Ms. Isenhoff makes you feel like you are living in the mid 1800's , dealing with the lifestyle, issues, difficulties, adventure, fun of life during a time when every family member was needed in order to survive during a time when everything was accomplished with human or animal power and you needed to make whatever you needed to live. On top of the normal life and workload of these times, there is also the difficulties brought by a Civil War. The ones that go to fight leave behind their homes which the remaining family must somehow maintain without the help of their strongest men folk.Youngsters must grow up very fast and must shoulder responsibilities far beyond their years.I highly recommend this book. It is an engaging trip to the past as well as an interesting historical journey. I really enjoyed this book! As a work of historical fiction, it gives a glimpse into the lives and struggles of families during the civil war. I think many readers can relate to Hannah- wanting adventure and to escape the daily routine but having to imagine a way out instead. Hannah's strong personality and desire to prove herself help her family pull through major struggles. I think this book would appeal to audiences young and old. The characters are easy to relate to and their trials, although set years ago, can be understood by so many today. Many know the work and sacrifice of having a family member serving in the military or the struggles of having an ill family member or financial hardship. This book is great for late elementary level and up! I'm looking forward to the final book in the trilogy! It's 1862 in Michigan and the beginning years of the Civil War. Hannah Wallace's brother and father have signed up to fight for the Union, leaving Hannah to save their farm. With incredible descriptive dialogue and character development, Author Michelle Isenhoff paints an accurate picture of small town life back in those tumultuous years which are often over-romanticized. Modern day middle school students and those of early high school years will learn much from lesson plans that are based upon this novel and the two others in Isenhoff's Divided Decade triology. The Civil War years held glory but also suffering and sorrow. Isenhoff portrays those years accurately through the lives of young teens caught up in what wartime brings to people everywhere. Fourteen-year old Emily Preston has been banished from her plantation home in South Carolina to her Uncle's boarding house in Detroit. This change in housing and accommodations is nothing compared to the change of attitude of the people around her. While Emily is attempting to survive her exile in the North, she is also coming to learn about the differences and similarities of the persons around her. Until she learns these valuable lessons, Emily will stop at nothing to try and get back to South Carolina, her family, and the life she understands.Book 2 of the Divided Decades Trilogy was just as entertaining as the first, Candle Star. To read more about Emily Preston's adventures, read book one of the Ella Wood trilogy: Ella Wood. Having read several other books by this author I was really looking forward to reading this one. I found it to be an enjoyable story but didn't see a connection to the previous selection in the trilogy. This may be due to the fact that it's been a while since I read that one. I liked seeing how war impacts life on the homefront. I'll definitely have to read the last book of the three. I enjoyed this script of memory lane of a work hard family life in agriculture with so much fun.Great days of knowledge lost in time to a new area of agriculture. Simplicity at its finest.Proud to have been a part of third generation gift from my grandparents. Loved it! Great story about the people left behind when the soldiers leave for the Civil War. The heroin was oddly modern in thought, but the details of her life were certainly difficult enough for the preteen who was trying to save her family's farm in her father's absence. I liked it. As an historical fiction writer myself, I appreciated the accurate feel of this book. Factual information slid in between the characters and scenery, making the story come alive and seem real. Well written in my opinion! Blood of the Pioneers by. Michelle IsenhoffExcellent ebook and I would recommend this ebook to one and all. I give this ebook a five (5) five star rating. Really enjoyed the writing and story of this one. Wish there was more to it. This was a very interesting fiction book that was historically accurate, but much more exciting than reading a textbook about the pioneers during the Civil War. This is an easy read, it gives the. reader a glimpse of everyday. life and the responsibility of families. Michelle Isenhoff - MICHELLE ISENHOFF writes for women, teens, and tweens. Her work has been reader-nominated for a Cybils Award, the Great Michigan Read, and the Maine Student Book Award. She's also placed as a semi-finalist in the Kindle Book Review Book Awards, a finalist in the Wishing Shelf Book Awards, and earned multiple Readers' Favorite 5 Star seals of approval. A former teacher and longtime homeschooler, Michelle has written extensively in the children's genre and been lauded by the education community for the literary quality of her work. More recently, she has enjoyed writing historical romance for older teens and women. Currently, she is relishing the creative freedom of branching out into adult speculative fiction. **Visit her blog at michelleisenhoff. **Sign up for her new release newsletter at bit/1bHFqaw. **Follow her on Facebook at facebook/michelleenhoff.